Tuning a piano is like tuning a violin or cello, or even a guitar…only there are many more strings (around 210 in most pianos), the strings are all different lengths as on a harp, and if you break a string…lots of work, time and misery to fix it! In this way, it is so different from a violin, cello or guitar. There are 88 keys or notes, but most keys (or “notes” ) use 3 strings tuned to the same pitch, vibrating in unison; a few lower notes have only 2 strings vibrating in unison, and the dozen to 15 lowest notes on the far left end of your piano only have one string each, big fat wound wires. 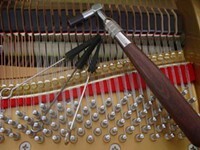 Ideally the piano should be “tuned to 440” (conventionally accepted orchestra pitch), but if the piano is very old, or the strings show much rust, it is wise to tune it down a bit to prevent breaking strings while raising the pitch. Piano makers recommend tuning twice per year, but everyday pleasure players can usually be happy with once a year tunings. The real reasons your strings go out of tune over time are, taking a pounding by being played, possible slippage of some of the pins or pegs, and vibration or shock from being moved or even bumped. Oh, I forgot the passage of time which sadly makes everything sag. Keep your piano tuned, it will make you a happier owner/ player/ user/ learning student etc. Nothing is worse than playing it well, but still sounding bad due to out-of-tune strings. A really smooth fast job will still take the tuner 90 minutes to get in and out of your hair. Fastest pianos to tune are grand pianos, next are spinets and consoles still taking minimum 2 hours and usually 2 and a half hours to open, clean, tune, and put back together. By the way, whoever tunes your piano, don’t let them skate by without vacuuming the bottom, and basic cleaning of the inside. In the bottom of the chamber, is not uncommon to find dead insects, an occasional little dead rodent, paper clips, kids’ toy parts, and all sorts of little things that don’t belong there. Tuning Fork vs Electric Tuning Instruments? If you have all day and your tuner is willing, ask for a fork tuning via circle of fifths method <being facetious, don’t really do this>. If not, let him or her use the modern little electric tuner, which makes it go much faster and gets an even better result! And be sure that your tuner is sounding each note against its interval, generally the fifth interval. if each note looks good on the electronic tuner AND sounds good against against its fifth interval, now you are in biz. Happy playing ! 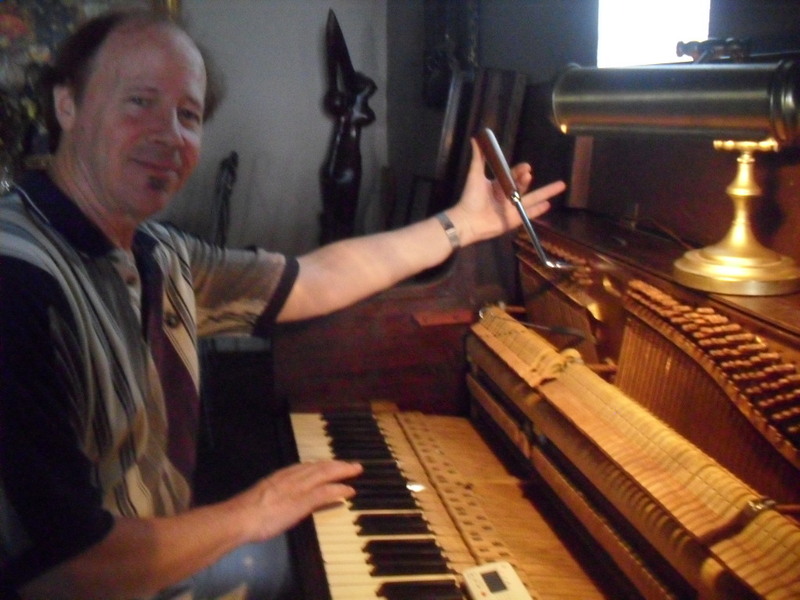 What Is Important, Not Important in a Piano Tuner – Tuning ? When can he do it? How well can he do it? Will he fix the sticking keys? How much will it cost? That is what IS important. What is not important? Has he tuned Beyonce’s piano? The Governor’s? The local School of Music? Does he play in a famous band? Does he look distinguished in his online pictures? All of those items are silly and won’t help YOU. At Houston Piano Tuner.net, we are all business with a little fun/ good cheer thrown in. We will make the soonest most convenient appointment possible, come with everything needed, get in there and tune your piano, fix your problems, and get out of your hair. ‘Nuff said? We can do or arrange any of these, just call to discuss. We have access to the lowest priced insured piano movers, and a fantastic salt of the earth piano refinisher modestly priced. The inspections / appraising is done by Rick the piano tuner/techie.